It’s been an interesting week leading up to the the American Thanksgiving holiday, which of course we acknowledge but don’t celebrate in Australia. This may come as a surprise to my American readers, since we Australians can also participate in the Black Friday sales which follow and mark the official start of the US festive season. It’s collateral good fortune. My professional development hours are mandatory in several ways. Without performing the necessary hours I would find myself in trouble with both my professional society, as well as my national registration body, and Medicare, Australia’s nationalised medicine scheme, where my patients can receive a rebate of in excess of $120 for each of 10 annual visits. 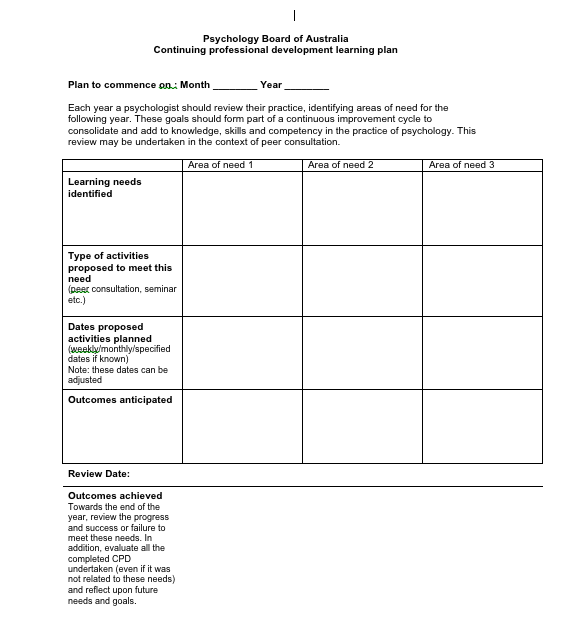 Each period of assessment which in this cycle lasts from July 2010 to November 2011, asks psychologists to provide at the outset a learning plan: What do you hope to learn about the professional practice of psychology during this period? In the case of the Sleeping Disorders workshop I undertook this week, it conforms with my training needs because one of the desires I have is to learn things about which I know very little or have no immediate practical need. In the case of this workshop, I don’t believe I have ever seen a child for a sleep disorder in 30 years of clinical work. 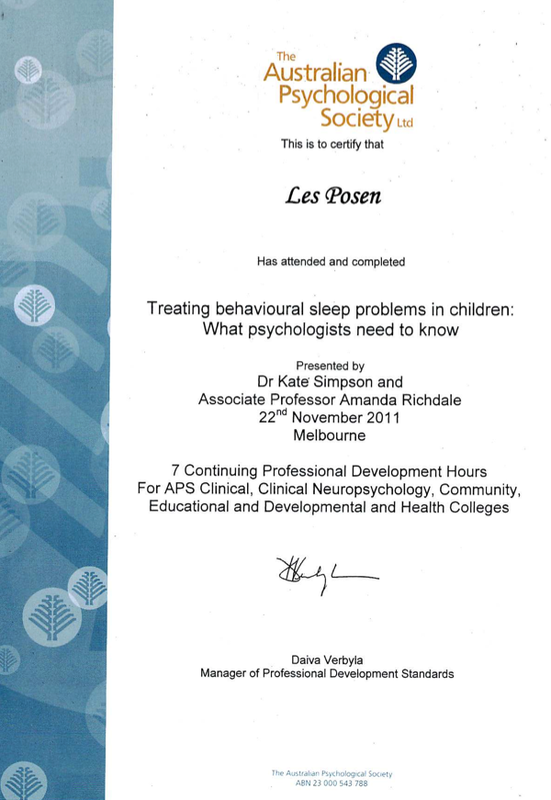 I’m not saying I haven’t seen a child with a sleep disorder – I have. It’s more that the referral has been for some other issue such as anxiety or depression of which sleep may be a component. So I don’t hang out a shingle that this is an area of specialisation but my desire to do the workshop was to challenge myself to attend a workshop for which there is no practical purpose. Strange, huh? The purpose however reminds me of the times I have attended very expansive psychology conventions where there are more than 30 parallel sessions. While I’ll attend quite a few where I expect to apply any learning directly to my clinical practice, I’ll also attend other convention presentations to hear the “names” in my profession present, even if their field is not something I pay particular attention to – who knows when I will ever have the same opportunity to hear them. But I also wander into presentations whose fields I know nothing about, where I have minimal prior knowledge of the subject, and where I’m likely to not know the names of authors or experimenters being referenced, nor their body of work, nor the acronyms or special concepts. I enter de novo. As a teacher to psychologists (and others) of presentation skills, it’s a great opportunity to see leaders in their field, as well as first timers, present their stuff, and think about their presentation style and what I can learn for inclusion in my next workshop. I must say however, that most times I attend psychology workshops and conventions, my learning is mainly what not to do, rather than come away thinking positively I really ought to include that in my workshop. But going into those lectures with no prior background nor interest in how I will apply what I’ll witness (thus not needing to contemplate if I am up to date, or if my knowledge is sorely underwhelming i.e, the pressure is off) is truly liberating. Without sitting in unconscious judgement of my own knowledge gaps, I am at liberty to think outside the box, or so I have discovered. I can make large intellectual leaps, because invariably what I learn ends up having some unpredicted relevance to my own work. I go in without pre-conceived ideas, with my only critical faculty being one of witnessing usually unimpressive presentation skills. This phenomenon is well known to those who witness quantum leaps in understanding when two seemingly unconnected fields of knowledge come together. Each field’s “blindspots” are laid bare, their dogma of “it can’t be done” challenged by the other group’s unawareness of what has been tried and found to have – up to now – failed. The self-imposed limitations of one field are the challenges to another. 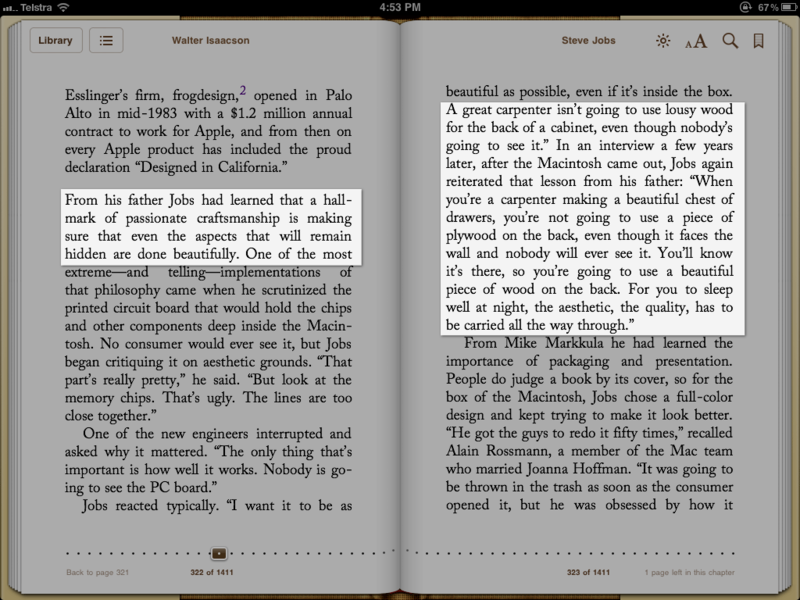 I was reminded of this with the reading of Steve Jobs’ authorised biography. 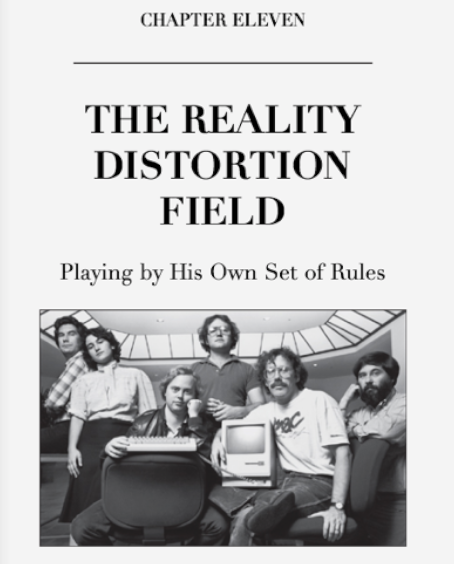 The Macintosh group’s naming of Jobs’ Reality Distortion Field (RDF) (below) was not so much based on his salesmanship and marketing of Apple products, but his ability to convince his workers that what they thought was not possible, was possible. There are several dozen references to the RDF in the biography, not just within Chapter 11. 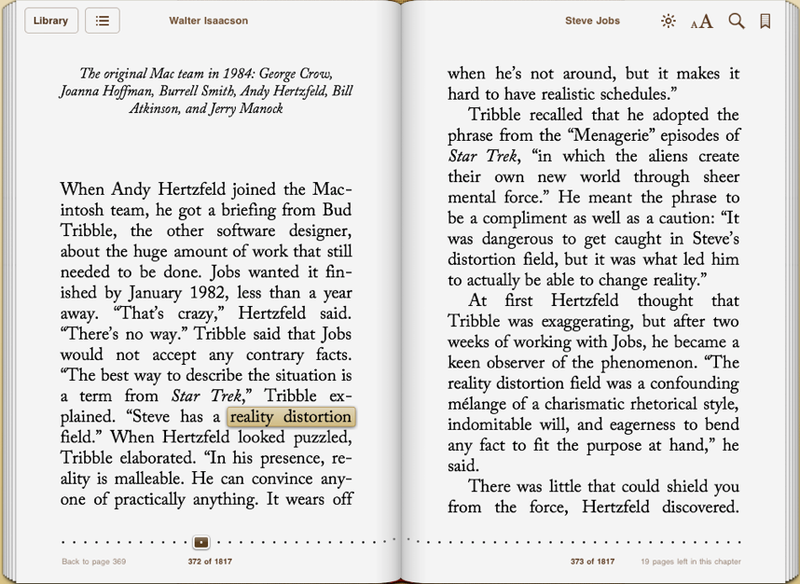 Of significance is its mention at the launch of Jobs’ NeXT computer in the time he was away from Apple. The idea of professions learning from each other, and respecting how each can make a contribution, is well known in health care, where patients may well be seen by several different health practitioners who care about the global health of the patient, rather than their own specialisation. To work together, the professions must learn about each other, and this has become known as InterProfessional Education (IPE). “Occasions when (students) from two or more professions learn with, from and about each other to improve collaboration and the quality of care”. Development, Delivery & Evaluation. Blackwell Publishing, Oxford, UK, 2005. The World Health Organization recently described IPE and collaborative practice is to mean. “Interprofessional education occurs when students from two or more professions learn about, from and with each other to enable effective collaboration and improve health outcomes. Interprofessional education is a necessary step in preparing a ‘collaborative practice-ready’ health workforce that is better prepared to respond to local health needs. Source: World Health Organization (2010): Framework for Action on Interprofessional Education & Collaborative Practice”. This is, by the way, why I was unhappy when my professional society wished to set up a mentor scheme for young psychologists and only wanted psychologists as mentors. I advised it would be too easy to confuse it with professional supervision, and mentoring would be best handled by experienced professionals outside of the practice of psychology. (That fell on deaf ears). “As a general guide, CPD (continuing professional development) activities should be relevant to the psychologist’s area of professional practice and have clear learning aims and objectives that meet the individual’s requirements”. This of course leaves it wide open to argue what is defined as “relevant”, and indeed to even define what is a professional practice. If for instance, I advertise my presentation skills training as almost unique in that few psychologists offer this training, and that my knowledge as a practising psychologist (spending 30 years persuading people to change) makes my workshops special, would my attending say Garr Reynolds Presentation Zen workshops which focusses less on my area of psychology and more on design theory be considered irrelevant? But there is more to interprofessional collaboration and the gains to be made that just patient care. Surgeons and commercial pilots are getting together on a frequent and formal basis to learn about risk management mitigation strategies and preparedness, as I learnt from one fear of flying physician patient and his father who was a leading surgeon. He had brought his College of Surgeons and Qantas Safety culture experts together to learn from each other. This of course is why so many have compared Steve Jobs to Edison for their shared abilities to recognise the nature of innovation, bring disparate people together, and then in Jobs’ case in particular, get them to see beyond their own self-imposed limitations, not just their own profession’s with which they identify, and for which there can be various stigma applied if one steps out of prescribed, but often not coded, limits. I’ve been there, and done that with regard to my own profession, especially the application of technologies in psychological endeavours. Also during the week, based on the article appearing in the media featuring my ideas on presenting and Keynote, I was contacted by a young psychologist (let’s call her by a nom de plume: Nicky) involved in a committee putting on a two day conference at which she was due to present on her Ph.D. Nicky asked if I would provide some coaching in constructing her message. Not surprisingly, when I loaded her Powerpoint onto my Macbook Pro and projected it up on the wall, it contain the usual presentation errors I ask psychologists and other scientists to give consideration to: loads of text, small pixelated images of dubious relevance, lack of clarity as to the central message, overuse of concepts which needed further clarification before making the central point, disengaging use of article citations and their page numbers, and so on. When I showed Nicky how I illustrate references, quotations, book titles and other devices using Keynote’s bag of tricks, she was wowed (as I expected). She “got it” immediately as most do when shown “before and after” slide modifications and we even worked through some simple transformations she could make before her presentation this week. All from an evidence-base. I’m at an age and experience in my own profession where such articles draw me to them like a moth to a flame. And as you will see, there are parallels between Drucker as a management innovator, and that of Steve Jobs – uncannily so. The work at the export firm was terribly boring, and I learned very little. Work began at 7:30 in the morning and was over at 4 in the afternoon on weekdays and at noon on Saturdays. So I had lots of free time. Once a week I went to the opera. On one of those evenings I went to hear an opera by the great 19th-century Italian composer, Giuseppe Verdi–the last opera he wrote, Falstaff. It has now become one of Verdi’s most popular operas, but it was rarely performed then. Both singers and audiences thought it too difficult. I was totally overwhelmed by it. Although I had heard a great many operas, I had never heard anything like that. I have never forgotten the impression that evening made on me. I have never forgotten those words–they made an indelible impression on me. When he was 18 Verdi was already a seasoned musician. I had no idea what I would become, except that I knew by that time that I was unlikely to be a success exporting cotton textiles. But I resolved that whatever my life’s work would be, Verdi’s words would be my lodestar. I resolved that if I ever reached an advanced age, I would not give up but would keep on. In the meantime I would strive for perfection, even though, as I well knew, it would surely always elude me. (Italics added). The pride in workmanship is perhaps what has differentiated Apple from its competitors in the world of technology. It causes many who don’t understand why some prefer to pay that little extra to be label them as “sheeple” or Apple “Fanbois” or more affectionately within the Apple community as “MacMacs”. But to drive the point home in the world of presentations, many who attend my workshops “complain” of my work ethic, with respect to labouring for hours over a slide which might only be on the screen for a few moments. Academics in particular claim they do not have the time to invest in their slides, hence their proclivity to “cut and paste” text from Word documents into Powerpoint slides, denude it of verbs and appropriate grammar, and shove a bullet point in front of the text. I labour over my slides because I make the time to do so; I want the audience to understand I value their attendance and a high quality engaging slideshow is their reward; constructing difficult slides requires me to both understand the message I want to deliver as well as dig down deep into the software I choose to use to really understand its strengths and weaknesses. The latter get reported, with examples of what I want to happen, to Apple’s iWork team. Finally, a slide or series of slides that work well can be repurposed for another presentation with a simple substituting of words and graphics, keeping the builds and transitions intact. So what does the back of a cabinet made by Steve Jobs’ father have to do with Peter Drucker? “You are wrong,” Phidias retorted. “The gods can see them.” I read this, as I remember, shortly after I had listened to Falstaff, and it hit me hard. I have not always lived up to it. I have done many things that I hope the gods will not notice, but I have always known that one has to strive for perfection even if only the gods notice. Jobs was relentless in his pursuit of change, not for the sake of it, but to discard even successful products and services when new technologies and materials became available. 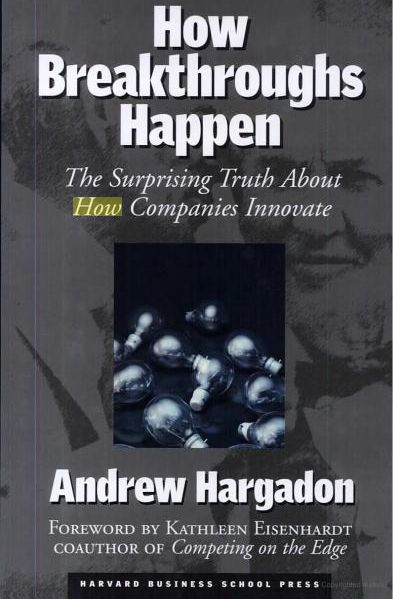 Others might have “stuck to a good thing” and milked a cash cow for all it was worth without engaging in much innovation, especially if the product had a near-monopoly hold in the marketplace. This was not Jobs’ way, and many were astonished when years ago he dumped Apple’s most successful iPod at the time, the iPod-mini, for the iPod Nano. The iPod-mini had itself been panned by critics at each launch. A few years later I moved to Frankfurt. I worked first as a trainee in a brokerage firm. Then, after the New York stock-market crash, in October 1929, when the brokerage firm went bankrupt, I was hired on my 20th birthday by Frankfurt’s largest newspaper as a financial and foreign-affairs writer. I continued to be enrolled as a law student at the university because in those days one could easily transfer from one European university to any other. I still was not interested in the law, but I remembered the lessons of Verdi and of Phidias. A journalist has to write about many subjects, so I decided I had to know something about many subjects to be at least a competent journalist. The newspaper I worked for came out in the afternoon. We began work at 6 in the morning and finished by a quarter past 2 in the afternoon, when the last edition went to press. So I began to force myself to study afternoons and evenings: international relations and international law; the history of social and legal institutions; finance; and so on. Gradually, I developed a system. I still adhere to it. Every three or four years I pick a new subject. It may be Japanese art; it may be economics. Three years of study are by no means enough to master a subject, but they are enough to understand it. So for more than 60 years I have kept on studying one subject at a time. That not only has given me a substantial fund of knowledge. It has also forced me to be open to new disciplines and new approaches and new methods–for every one of the subjects I have studied makes different assumptions and employs a different methodology. Again, the parallels to how Jobs conducted his life are clear. In terms of relevance to me as a professional, I have always asserted that Professional associations and societies and Registration Boards who assert CPD is good for protecting the public from out of date practitioners have badly sold CPD: it’s as much about the welfare of the practitioner as it is about the welfare of the profession and the public it serves. Unfortunately, too often I see sticks and not carrots in this domain. As agents of change, we psychologists have much to learn in this domain. The next experience to report in this story of keeping myself intellectually alive and growing is something that was taught by an editor-in-chief, one of Europe‘s leading newspapermen. The editorial staff at the newspaper consisted of very young people. At age 22 I became one of the three assistant managing editors. The reason was not that I was particularly good. In fact, I never became a first-rate daily journalist. But in those years, around 1930, the people who should have held the kind of position I had–people age 35 or so–were not available in Europe. They had been killed in World War I. Even highly responsible positions had to be filled by young people like me. The editor-in-chief, then around 50, took infinite pains to train and discipline his young crew. He discussed with each of us every week the work we had done. Twice a year, right after New Year’s and then again before summer vacations began in June, we would spend a Saturday afternoon and all of Sunday discussing our work over the preceding six months. The editor would always start out with the things we had done well. Then he would proceed to the things we had tried to do well. Next he reviewed the things where we had not tried hard enough. And finally, he would subject us to a scathing critique of the things we had done badly or had failed to do. The last two hours of that session would then serve as a projection of our work for the next six months: What were the things on which we should concentrate? What were the things we should improve? What were the things each of us needed to learn? And a week later each of us was expected to submit to the editor-in-chief our new program of work and learning for the next six months. I tremendously enjoyed the sessions, but I forgot them as soon as I left the paper. Almost 10 years later, after I had come to the United States, I remembered them. It was in the early 1940s, after I had become a senior professor, started my own consulting practice, and begun to publish major books. Since then I have set aside two weeks every summer in which to review my work during the preceding year, beginning with the things I did well but could or should have done better, down to the things I did poorly and the things I should have done but did not do. I decide what my priorities should be in my consulting work, in my writing, and in my teaching. I have never once truly lived up to the plan I make each August, but it has forced me to live up to Verdi’s injunction to strive for perfection, even though “it has always eluded me” and still does. Most Fridays, I prefer not to see patients, instead writing reports, blogging, reading, and reflecting with colleagues on how the week went: What did I learn from my patients this week; what of the presentation I gave last weekend – could it be improved knowing what worked and what didn’t and the audience reactions to both. It doesn’t give me a long weekend, as I’m often flying with patients on Saturday or Sunday to help them overcome their fear of flying. But this time for reflection and solitude is very important. The first time I saw Steve Jobs on the Apple Cupertino campus I was being hosted at lunch by one of the iWork senior staff, and there was Steve, about 100 metres away, walking alone around the campus, deep in thought. He was very thin at the time, somewhat stooped, but you could almost hear the cogs of his mind ticking over like an exquisite Swiss timepiece. I’ve thought that with my current crop of supervisees we should sit down in our next session and work though their new professional learning plan, as mandated by the national registration board, get the signed paperwork out of the way, and work assiduously to NOT do it, but exceeding it in some unpredictable yet justifiable way. As Drucker noted, after six decades, he never succeeded with his plans, such was his striving for perfection, and the limitations such planning can embrace. One of the important things that I do for my own learning, both as a psychologist and a presenter, is watch how experts work. It could be going to lectures and workshops by people at the top of their profession, but whose body of work I have only passing interest in. Sooner or later, an expert will teach you something. But as Alan Funt would say, it may happen when you least expect it. Or it could be watching advertisements or those current affairs shows which each have limited time to get across their messages, usually aiming at the lowest common denominator. They need to pull out all the technology and story telling stops to do so, and I watch very closely how they do this, and wonder if I can emulate them in Keynote. Other times, I watch high brow documentaries for the same reason, and more and more we are seeing amazing CGI to get across very complex ideas. Please locate Brian Green’s NOVA documentary series, Fabric of the Universe, to see what I am talking about, here. Apart from having a deep foundational knowledge of their subject, experts have the ability to impart that knowledge to others who only possess superficial knowledge. They also possess a methodology for confronting data points which do not conform to their deep structural knowledge of their subject. They are not frightened of their theories being challenged but instead, embrace the challenge in an effort to advance the science, and thus the profession. While they have a healthy appreciation of how their expertise developed, they do not look to history to provide the way forward; instead, they are quick to see it as irrelevant if the current facts negate that history. True expertise I believe is not adhering to old ways of doing things if the current evidence shows those ways to be false. In my own profession, too often have I seen patients who have consulted colleagues who spent considerable time going through childhood history seeking the aetiology of the presenting concern. It’s a luxury we in Australia no longer have as this month rebated sessions under our socialised Better Access to Psychologists scheme have been cut from an annual maximum of 18, to a maximum of 10. The evidence base which saw psychologists’ services enter the Medicare system in the first place in 2006 is one that shows mild to moderate (and sometime severe) impairments, such as anxiety and depression, require between 16 and 20 sessions from a competent psychologist for significant and lasting change to occur. I have always worked briefly, but ten sessions is getting very close to pushing me to my limits, even though I aim to achieve significant results in 6 to 8 sessions, leaving several sessions up our sleeves for follow up, and unexpected setbacks. I don’t bring a great deal of focus to childhood origins and behaviour, but prefer to hear the patient’s theories of why their situation has presented itself, what they believe is needed to change that, how they know when change has been effected, and most importantly what factors are maintaining the current misery-causing situations, since they will become our targets for change. Occasionally, patients go back to parents or other figures of their childhood and get their side of the story. This sometimes sees a revision of their own story, but rarely does this cause an epiphany leading to behavioural change. That still requires work. 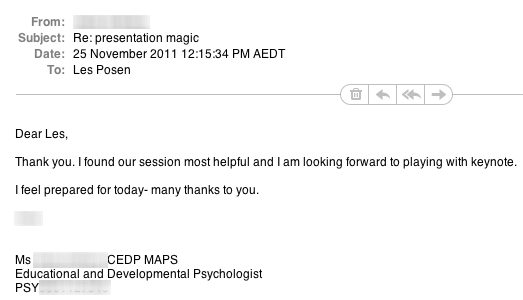 How change takes place is really what I do, both with my patients and those who attend Presentation Magic training, for whom the task is convincing them to move away from the tradition and style of disengaging Powerpoint to something more effective and rewarding. Steve Jobs was one to rarely look back, and his biography and commentary about him focusses on his lack of nostalgia (except for his family) and his relentless pursuit of the new, because it would provide a better answer to problems than the old. My next learning experience came a few years after my experience on the newspaper. From Frankfurt I moved to London in 1933, first working as a securities analyst in a large insurance company and then, a year later, moving to a small but fast-growing private bank as an economist and the executive secretary to the three senior partners. One, the founder, was a man in his seventies; the two others were in their midthirties. At first I worked exclusively with the two younger men, but after I had been with the firm some three months or so, the founder called me into his office and said, “I didn’t think much of you when you came here and still don’t think much of you, but you are even more stupid than I thought you would be, and much more stupid than you have any right to be.” Since the two younger partners had been praising me to the skies each day, I was dumbfounded. And then the old gentlemen said, “I understand you did very good securities analysis at the insurance company. But if we had wanted you to do securities-analysis work, we would have left you where you were. You are now the executive secretary to the partners, yet you continue to do securities analysis. What should you be doing now, to be effective in your new job?” I was furious, but still I realized that the old man was right. I totally changed my behavior and my work. Since then, when I have a new assignment, I ask myself the question, “What do I need to do, now that I have a new assignment, to be effective?” Every time, it is something different. Discovering what it is requires concentration on the things that are crucial to the new challenge, the new job, the new task. One of the things Jobs became legendary for was his focus. In particular, how to take a product or service and remove all that was unnecessary to the task, such as flashing lights and shiny decals, and make sure form matched function. If you into an Apple store you will experience this focus, bot just by playing with the products but in the actual customer service itself. Jobs played to his strengths, focussing when he returned to Apple in 1997 (the year Drucker wrote his article) on simplifying the product line, which had grown to monstrous and unprofitable proportions under previous Apple CEOs. Jobs wanted Apple’s return to its roots, to design and make the sort of products he had conceived of at Apple’s birth: ones that could cause massive change in how people worked. While others around him had wanted Apple to compete with the “Wintel” (Windows on Intel powered PCs) juggernaut by cloning the Apple operating software to other PC makers, Jobs killed those programs at great expense to focus on what he believed Apple did best. Rather than a chase to the bottom of the barrel where profits were wafer thin and based on selling masses of “what everybody else is doing” products, Jobs went for the higher ground, knowing – as it was for his favourite auto maker, Mercedes Benz – that there will always be a market for high quality luxury goods where handsome profits can also be made. In time, the quality of the higher end, expensive products would filter down into less expensive, more easily afforded goods, such as the iPod Shuffle, an inexpensive iPod to groom young people into buying Apple products. To fill their Shuffles, they needed iTunes and its downloadable music. And when they could afford it, Macintosh desktop and laptop computers. 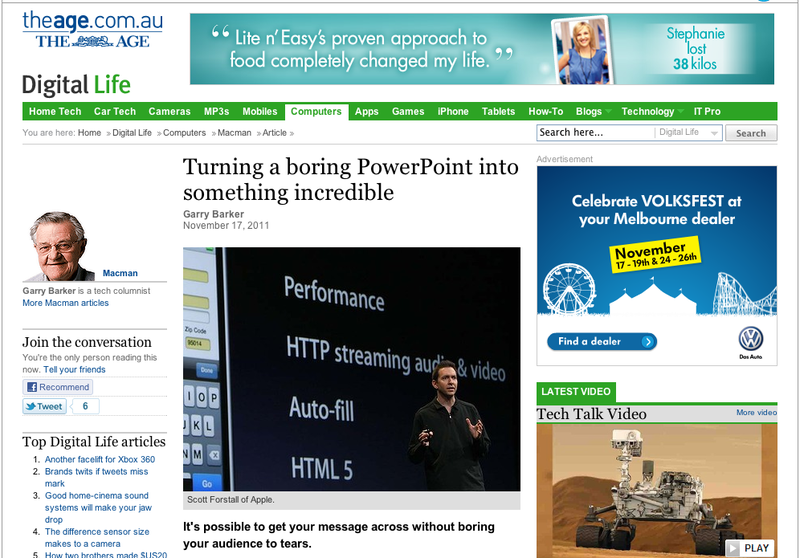 When it comes to presentations, I too play to my strengths, daring myself to take risks, to challenge my audience, and not give in to the lowest common denominator, even if it cancelling a presentation to a conference audience whose organisers demand I convert my Keynotes to Powerpoint for their convenience, not for the edification of the paying attendees. Quite a few years later, around 1945, after I had moved from England to the United States in 1937, I picked for my three-year study subject early modern European history, especially the 15th and 16th centuries. I found that two European institutions had become dominant forces in Europe: the Jesuit Order in the Catholic South and the Calvinist Church in the Protestant North. Both were founded independently in 1536. Both adopted the same learning discipline. Whenever a Jesuit priest or a Calvinist pastor does anything of significance–making a key decision, for instance–he is expected to write down what results he anticipates. Nine months later he traces back from the actual results to those anticipations. That very soon shows him what he did well and what his strengths are. It also shows him what he has to learn and what habits he has to change. Finally, it shows him what he has no gift for and cannot do well. I have followed that method for myself now for 50 years. It brings out what one’s strengths are–and that is the most important thing an individual can know about himself or herself. It brings out areas where improvement is needed and suggests what kind of improvement is needed. Finally, it brings out things an individual cannot do and therefore should not even try to do. To know one’s strengths, to know how to improve them, and to know what one cannot do–they are the keys to continuous learning. The final parallel is perhaps the most haunting and significant one. Here, in the final installment of his seven learning experiences, Drucker writes of he and his father visiting the great economist, Joseph Schumpeter, who had been a co-worker of his father’s in Europe when both were very young. When he writes of comparing his father to Schumpeter, (below) I am reminded in his description of Steve Jobs and Steve Wozniak, and their contrasting personalities. In this learning lesson, Drucker uses his visit to Schumpeter to review lessons learnt of a lifetime, of what’s important, and of giving consideration to one’s legacy to one’s fellow human beings. This would appear to have been an increasingly important concept for Jobs too, as he oversaw the return of Apple to past glories, and indeed way beyond most people’s expectations. Having achieved incredible fame and fortune, he turned his attention to his legacy, both to Apple and mankind. This phrasing might irk many people, but it certainly helps explain the unconstrained outpouring of grief and sorrow at Jobs’ passing only seven weeks ago, with so much ahead of him to yet achieve. But once he knew he had to get his affairs in order, as he had been told early in his diagnosis of cancer, he went about it methodically and with an eye to his legacy. No doubt, he first thought of his family and how to care for them in his absence, and to some extent Isaacson’s book is meant to be a source of care for his children, to help explain his absences from important developments in their lives. But he also turned his attention to the bigger picture of Apple itself, and how to leave the company he’d co-founded when he was 21, in good hands and with a culture and ability to strategise that would long outlive him. Not so much in his image (he didn’t want a “What would Walt do” paralysis which afflicted Disney after his passing), but in his pursuit of perfection, continuous learning, and making products and services which make a difference in people’s lives. It’s no surprise then that he set up a Knowledge Management program – Apple University – to impart his life’s learnings, through the leadership of Yale’s Joel Podolny. One more experience, and then I am through with the story of my personal development. At Christmas 1949, when I had just begun to teach management at New York University, my father, then 73 years old, came to visit us from California. Right after New Year’s, on January 3, 1950, he and I went to visit an old friend of his, the famous economist Joseph Schumpeter. My father had already retired, but Schumpeter, then 66 and world famous, was still teaching at Harvard and was very active as the president of the American Economic Association. In 1902 my father was a very young civil servant in the Austrian Ministry of Finance, but he also did some teaching in economics at the university. Thus he had come to know Schumpeter, who was then, at age 19, the most brilliant of the young students. Two more-different people are hard to imagine: Schumpeter was flamboyant, arrogant, abrasive, and vain; my father was quiet, the soul of courtesy, and modest to the point of being self-effacing. Still, the two became fast friends and remained fast friends. He must have seen an amazed look on my father’s face, because he continued, “You know, Adolph, I have now reached the age where I know that being remembered for books and theories is not enough. One does not make a difference unless it is a difference in the lives of people.” One reason my father had gone to see Schumpeter was that it was known that the economist was very sick and would not live long. Schumpeter died five days after we visited him. I have never forgotten that conversation. I learned from it three things: First, one has to ask oneself what one wants to be remembered for. Second, that should change. It should change both with one’s own maturity and with changes in the world. Finally, one thing worth being remembered for is the difference one makes in the lives of people. I am telling this long story for a simple reason. All the people I know who have managed to remain effective during a long life have learned pretty much the same things I learned. That applies to effective business executives and to scholars, to top-ranking military people and to first-rate physicians, to teachers and to artists. Whenever I work with a person, I try to find out to what the individual attributes his or her success. I am invariably told stories that are remarkably like mine. Your observations and comments about your own learning experiences, for the education of others, is welcomed, below.